Micro-blogging service Twitter adds features that to allow users to add their location to their status updates, adding to speculation about how the service will make money. Twitter is adding the ability to geo-tag individual updates Twitter is bringing easy geo-tagging to the popular micro-blogging service, and it adds another possible way that the service might be able to make money. We're gearing up to launch a new feature which makes Twitter truly location-aware. 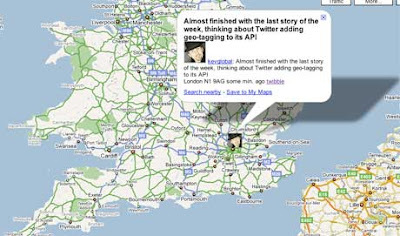 A new API will allow developers to add latitude and longitude to any tweet. Folks will need to activate this new feature by choice because it will be off by default and the exact location data won't be stored for an extended period of time. However, if people do opt-in to sharing location on a tweet-by-tweet basis, compelling context will be added to each burst of information. As Stone mentioned in his post, third party developers like Germany's Twibble have already produced geo-location services for Twitter. They relied on information pulled from the location details in users' profiles or from location information in the form of latitude and longitude or hash tags in the tweet itself.